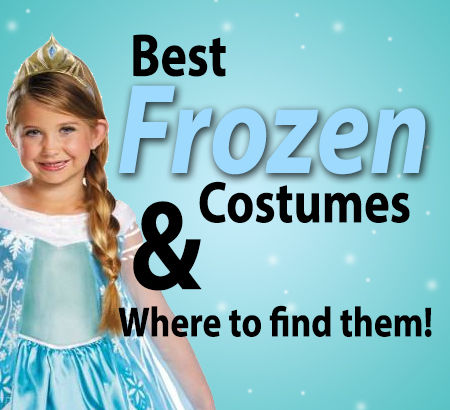 Home » Disney Deals » Best Frozen Halloween Costumes for 2014 – And Where to Find Them! Best Frozen Halloween Costumes for 2014 – And Where to Find Them! Disclaimer: This post may contain affiliate links which help support the site. If you found this post helpful, please use our links. Thank you so much! This Halloween will give us lots of Anna, Elsa, and Olaf costumes! However, these costumes are harder to find than a snowman in summer! My recommendation is to buy early if at all possible. I’ve complied this list to give you every possible option at finding the perfect costume for you or your little one! Do note pricing changes continually, and prices listed may be different than when you purchase. Walmart overall has the best pricing on economy costumes. For other stores, do lookout for sales and coupons. The price listed may be higher, but once you factor in any coupons you could come out ahead. Definitely check out the Etsy offerings at the end of this post as well. Now, for Halloween Disguise is the licensed manufacturer for most costumes you’ll see at big box stores, party stores, Halloween specialty shops and more. These costumes are meant to last one night only. Keep clear packing tape handy in case any rips occur, and apply to the inside of the tear. Disguise has 7 different Frozen styles. “Classic” refers to the lower-end style, and “Deluxe” has a bit more detail. Do check wholesale clubs for these costumes as well. My local Costco had an Anna costume from Disguise including wig for $15. That costume is not pictured above, and likely a Costco-exclusive. It is not currently on Costco’s website. Party City also has a line of exclusive designs, although it is not clear if these are manufactured by Disguise. Party City also has an exclusive tutu dresses for Anna and Elsa that run between $40 and $60. JCPenny has come out with a line of Disney Princess costumes and accessories that are actually really great. In terms of quality these are head and shoulders above Disguise, but not quite at Disney Store level. You should get a lot of play beyond Halloween with these costumes. These costumes are the best bang for your buck, making them Pixie Budget’s pick. Do note both dresses have lots of glitter! JCPenney costumes appear to have sold quickly, so one probably needs to act fast. If they are sold out online, check the store locator for costumes in your area. UPDATE: Disney Store costumes are in stock online, however Olaf has sold out as of 10/6/14. Elsa costumes were spotted at my local Seattle Disney Store 10/5/14. Disney Store has a high quality costume, and is definitely the most expensive of the licensed designs. They are also this Halloween’s “it” item. They’ve been extremely hard to find, and have sold out quickly. If you’re in the market for one of these, purchase now. The Disney Store also has lots of super-cute accessories, and if you can’t find the dress in stores, you may be able to find shoes, crowns, etc. Etsy is full of creative ideas, and it’s a great way to support another mom making clothes. You do have to factor in lead times, and always check where the costume is shipping from so there are no further delays in customs. Here are a few costumes I thought were ridiculously cute!